“Dog is Man’s best friend” is a common saying for a reason. It is a phrase that populated itself out of the undying love and unbreakable bond that dogs form with their owners. Every dog owner knows the underlying current of anxiety that comes with being a pet-parent. You always wonder how you’ll ever deal after they’re gone. After all, it doesn’t take much to get used to the inexhaustible love your furry companion showers you with every time you open the door…or your eyes, for that matter. One thing many of us doggy lovers don’t often think about though is what will happen to our closest friend after we pass on. Dogs and other pets don’t just become like family, they are family! They are with you every moment possible, and wouldn’t have it any other way. So naturally, when someone they are close to dies, they feel emotions just like you or I would. Such is the experience of Sadie, a Border Collie/Dalmatian Shepard mix, who just lost one of her owners. The heartbroken pup was adopted at 8 weeks old and has been a faithful and steadfast member of the Beaulieu family ever since. 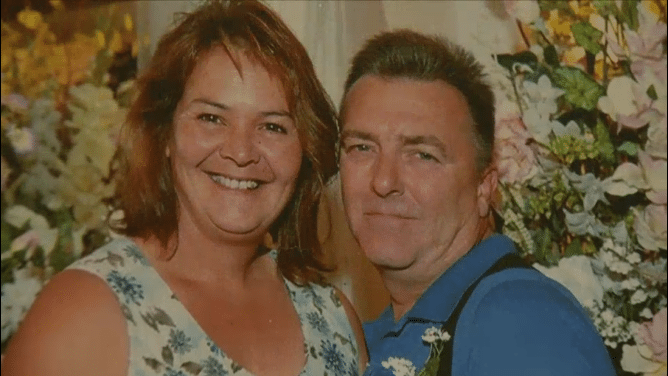 Unfortunately, Julia Beaulieu lost her husband to a heart attack several months ago, but she definitely isn’t going it alone. She was very lost. Definitely in distress you know, she wouldn’t eat…She came and she laid with him, and pushed his hand with her head, almost as if to get him to pet her. Losing someone is never easy, even if you have all the understanding, support, and emotional tools to deal with it. 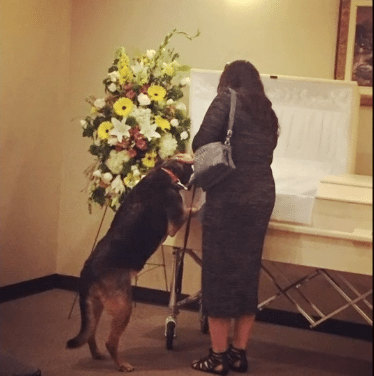 A dog doesn’t have the ability to understand why their loved one is gone, only that they aren’t there and they miss them. As Sadie went deeper into her grieving, she wouldn’t eat for ten days and lost ten pounds in the process. That’s a terrifying amount of weight for a dog to lose in such a small time-frame, and Julia began to worry. She would listen for his truck. She would go stand at the window and look…Then you would just see the big umph and she’d just lay there, as if shew knew…she was waiting for him to come home. Convention be damned; Julia decided she was taking Sadie to her husband’s funeral and letting her have a chance to say farewell. If she needed it, so did the dog. 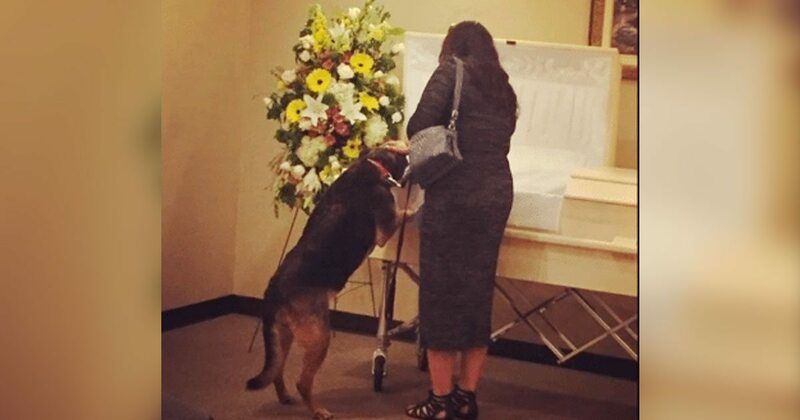 Julia describes how Sadie stood on hind-legs next to her to peer into her owner’s casket. Perplexion seemed to wear off as reality sunk in. Julia said she felt Sadie suddenly relax. After getting some closure from the funeral, Sadie has started to eat again. She is slowly coming back to herself as she learns to deal with the loss of her Daddy. Not only is it a touching moment for people who are dog owners, and just really showed the connection between humans and their pets and how tight it is; but this is a tool, I thought to myself, Julia will need this photo. Thankfully, the CEO of the funeral home found this moment as touching as we did, when he decided to snap a photo of the two side-by-side. Capturing a moment that proves dog really is man’s best friend.